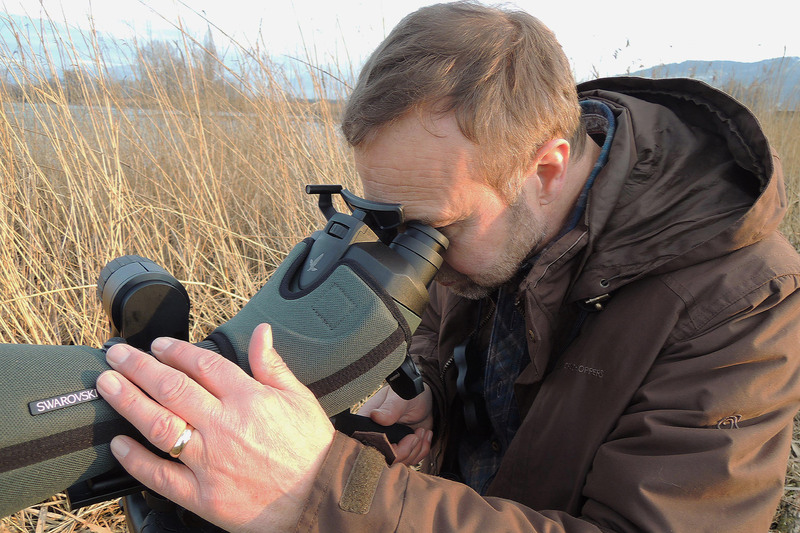 Back in February 2017, I was invited to the unveiling of Swarovski Optik's latest optical innovation: the BTX binocular spotting scope, where I was offered the chance to test it out in a range of habitats, from snow-covered alpine passes to low-lying wetlands and marshes. This was a far cry from the reality of everyday birding in Britain, so I have spent some time more recently pushing the BTX to its limits back home in a number of more familiar local birding spots in the Midlands. 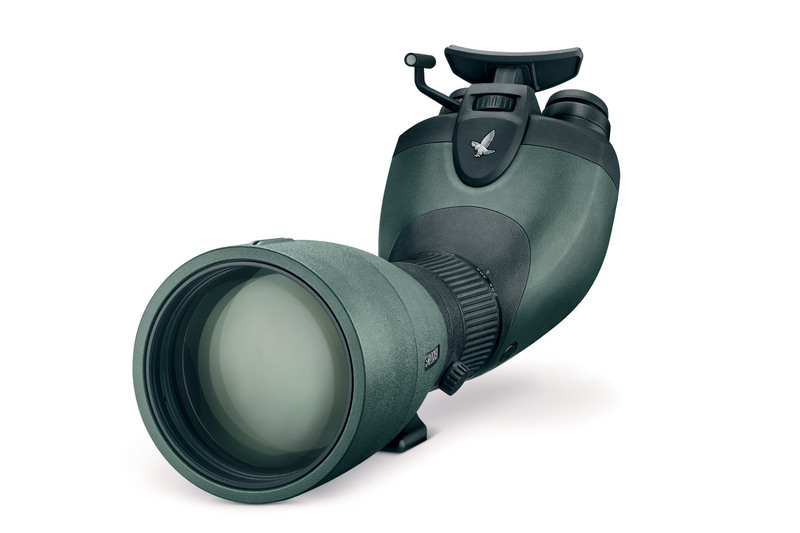 Swarovski's modular ATX spotting scope series comprises three models based on the same rear section, which houses the prisms and eyepiece, to which a choice of front sections can be added. This gives the user flexibility to use a 95 mm, an 85 mm or a 65 mm objective with the rear section while, at the same time, allowing the scope to be broken down for storage or travelling. The BTX is a binocular replacement for the single-eye rear section, sharing its compatibility with the three objective modules. It is attached via a quick and easy bayonet-fitting mechanism, which is automatically locked in place and released by pressing a fingertip-sized button lying flush with the surface of the BTX module. The practicality of using this piece of equipment, which represents a big step up from a conventional telescope, quickly becomes evident on three levels: size, weight and performance. I was using the combination of the 95 mm objective with the binocular module. I also added Swarovski's ME 1.7x magnification extender to beef up the long-range viewing performance. The imagery is delivered under a fixed magnification of either 35x when used with the 95 mm objective module or 30x when in use with either the 85 mm and 65 mm modules. There is no zoom function, as this would have made the resultant combination both too long and too heavy, and the cost of the unit would have also risen significantly. The ME 1.7x increases the magnification to 60x and 50x respectively. It goes without saying that the build quality and appearance of the BTX are to the same high standards of those of the ATX, so let's look first at what you get in terms of optical performance. Field-flattener lenses and those with a fluoride component have been used to produce a uniform sharpness across the field and to enhance colour fidelity. Without the extender fitted, the BTX produces a very high-quality image: bright and pin-sharp to the very edges of the field. The contrast is very good and chromatic aberration is pegged to the minimum, meeting the expectations from a top-tier piece of optical equipment. In direct comparison with the equivalent ATX at the same magnification, however, the image brightness appeared to be slightly lower. But only slightly. Fitting the extender between the eyepiece module and the objective module, and so ramping up the magnification to 60x, also produced a very pleasing image, with all the attributes and characteristics of the above, although it appeared a little less bright and 'contrasty'. The field of view is 32 m at 1000 m with the ATX 95 mm (it's 38 m with the 65 mm and 37 with the 85 mm modules). It never appeared too narrow, even with the extender fitted while I was scanning the extensive muddy bays of a couple of my local reservoirs. Mike in action with the BTX. With the top-notch image a given from the outset, the true worth of the BTX lies in its superior ergonomics – after all, that was the intended result of the initial design concept. The aim was to set new standards in comfort and practicality in the way we view wildlife, by using both eyes to more comfortably view an image through a telescope. In this it fully succeeds. Using a conventional telescope can produce eye-strain and discomfort as a result of squinting for long periods, but this simply does not happen with the BTX. The eyepieces have two 'blades' located on their undersides. These allow the interpupillary distance to be adjusted with sufficient resistance to prevent their accidentally being moved after being set to the correct position and, as the eyepieces operate simultaneously, the system always remains centred. Once positioned, the single-eye focusing adjustment is made using a half-milled ring on the right ocular, which has an incremental scale with eight plus or minus positions each side of a mid-point. It offers just enough turning resistance to prevent it becoming accidentally moved from its setting. So the model benefits from the combination of high telescope magnification with comfortable, two-eye binocular-style viewing. But there's more. The forehead rest, which can be easily and smoothly adjusted to any height is arguably the greatest aid to comfort in the whole BTX unit. This was an enormous boon to prolonged viewing and will no doubt appeal to seawatchers and those counting migrating raptors. The starpoint aiming aid was useful to a limited degree and I had little call to use it. Swarovski having gone to some lengths to raise the comfort factor, I found the eyecups a little disappointing. There are three subtle twist-lock positions, but the rubber coverings are very thin and barely cover the metalled ends. Consequently, they feel quite hard and proved not to be the most comfortable I've encountered on a binocular. One element that might detract from gains made in comfort is the total weight of the equipment. The kit I was testing weighed in just shy of 3,000 g with the extender fitted. The weight would be less when using smaller objective modules, but those of us prone to slinging our tripods across our shoulders should be aware that the total combined weight bears down heavily on a T-shirted shoulder during the summer months. Bear in mind also that adding a BTX module to any of the three ATX objectives effectively shifts the centre of gravity away from the tripod foot so a head with an adjustable rail or counterbalance mechanism is recommended. In summing up what some might describe as a postmodern triumph of technology, we should return to the rationale behind the design concept. Does the BTX fulfil what it sets out to achieve? Yes – and very effectively, too. After spending even a short period of time using it, there is every likelihood that you won't want to look through a conventional telescope again. But the next task on the horizon will be to explore ways in which it can be manufactured and produced at a significantly lower weight – and that won't be easy. This review was originally published in the September 2017 issue of Birdwatch magazine.